A map, circa 1590, by Tiberio Alfarano of the interior of Old Saint Peter's, noting the locations of the original chapels and tombs. Construction began by orders of the Roman Emperor Constantine I between 318 and 322, and took about 40 years to complete. Over the next twelve centuries, the church gradually gained importance, eventually becoming a major place of pilgrimage in Rome. Papal coronations were held at the basilica, and in 800, Charlemagne was crowned emperor of the Holy Roman Empire there. In 846, Saracens sacked and damaged the basilica. The raiders seem to have known about Rome's extraordinary treasures. Some holy – and impressive – basilicas, such as St. Peter's Basilica, were outside the Aurelian walls, and thus easy targets. They were "filled to overflowing with rich liturgical vessels and with jeweled reliquaries housing all of the relics recently amassed". As a result, the raiders destroyed Peter's tomb and pillaged the holy shrine. In response Pope Leo IV built the Leonine wall and rebuilt the parts of St. Peter's that had been damaged. In 1099, Urban II convened a council including St Anselm. Among other topics, it repeated the bans on lay investiture and on clergy's paying homage to secular lords. 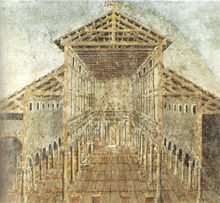 The design was a typical basilica form with the plan and elevation resembling those of Roman basilicas and audience halls, such as the Basilica Ulpia in Trajan's Forum and Constantine's own Aula Palatina at Trier, rather than the design of any Greco-Roman temple. Constantine went to great pains to build the basilica on the site of Saint Peter's grave, and this fact influenced the layout of the building. The Vatican Hill, on the west bank of the Tiber River, was leveled. Notably, since the site was outside the boundaries of the ancient city, the apse with the altar was located in the west so that the basilica's façade could be approached from Rome itself to the east. The exterior however, unlike earlier pagan temples, was not lavishly decorated. The church was capable of housing from 3,000 to 4,000 worshipers at one time. It consisted of five aisles, a wide central nave and two smaller aisles to each side, which were each divided by 21 marble columns, taken from earlier pagan buildings. 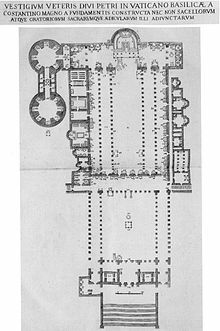 It was over 350 feet (110 m) long, built in the shape of a Latin cross, and had a gabled roof which was timbered on the interior and which stood at over 100 feet (30 m) at the center. An atrium, known as the "Garden of Paradise", stood at the entrance and had five doors which led to the body of the church; this was a sixth-century addition. The altar of Old St. Peter's Basilica used several Solomonic columns. According to tradition, Constantine took these columns from the Temple of Solomon and gave them to the church; however, the columns were probably from an Eastern church. When Gian Lorenzo Bernini built his baldacchino to cover the new St. Peter's altar, he drew from the twisted design of the old columns. Eight of the original columns were moved to the piers of the new St. Peter's. The great Navicella mosaic (1305–1313) in the atrium is attributed to Giotto di Bondone. The giant mosaic, commissioned by Cardinal Jacopo Stefaneschi, occupied the whole wall above the entrance arcade facing the courtyard. It depicted St. Peter walking on the waters. This extraordinary work was mainly destroyed during the construction of the new St. Peter's in the 16th century, but fragments were preserved. Navicella means "little ship" referring to the large boat which dominated the scene, and whose sail, filled by the storm, loomed over the horizon. Such a natural representation of a seascape was known only from ancient works of art. The fragment of an eighth-century mosaic, the Epiphany, is one of the very rare remaining bits of the medieval decoration of Old St. Peter's Basilica. The precious fragment is kept in the sacristy of Santa Maria in Cosmedin. It proves the high artistic quality of the destroyed mosaics. Another one, a standing madonna, is on a side altar in the Basilica of San Marco in Florence. Two pairs of the original Solomonic columns now support curved pediments to form trompe-l'œil porticoes on the piers of St. Peter's. A sketch by Giacomo Grimaldi of the interior of St. Peter's during its reconstruction, showing the temporary placement of some of the tombs. Since the crucifixion and burial of Saint Peter in 64 A.D., the spot was thought to be the location of the tomb of Saint Peter, where there stood a small shrine. With its increasing prestige the church became richly decorated with statues, furnishings and elaborate chandeliers, and side tombs and altars were continuously added. The structure was absolutely filled with tombs and bodies of saints and popes. Bones continued to be found in construction as late as February 1544. The majority of these tombs were destroyed during the sixteenth and seventeenth centuries demolition of Old St. Peter's Basilica (save one which was destroyed during the Saracen Sack of the church in 846). The remainder were translated in part to modern St. Peter's Basilica, which stands on the site of the original basilica, and a handful of other churches of Rome. Along with the repeated translations from the ancient Catacombs of Rome and two fourteenth century fires in Basilica of St. John Lateran, the rebuilding of St. Peter's is responsible for the destruction of approximately half of all papal tombs. As a result, Donato Bramante, the chief architect of modern St. Peter's Basilica, has been remembered as "Maestro Ruinante". The Stefaneschi Altarpiece is a triptych by the Italian medieval painter Giotto, commissioned by Cardinal Giacomo Gaetani Stefaneschi to serve as an altarpiece for one of the altars of Old St. Peter's Basilica in Rome. ^ a b c Boorsch, Suzanne (Winter 1982–1983). "The Building of the Vatican: The Papacy and Architecture". The Metropolitan Museum of Art Bulletin. 40 (3): 4–8. ^ Davis, Raymond, The Lives of the Ninth-Century Popes (Liber pontificalis), (Liverpool University Press, 1995), 96. ^ Barbara Kreutz (1996). Before the Normans: Southern Italy in the Ninth and Tenth Centuries. University of Pennsylvania Press pp. 25–28. ^ Rosemary Guiley, The Encyclopedia of Saints, (InfoBase Publishing, 2001), 208. ^ William Tronzo (2005). St. Peter's in the Vatican. Cambridge University Press. p. 16. ISBN 0-521-64096-2. ^ Sobocinski, Melanie Grunow (2005). Detroit and Rome. The Regents of the Univ of Michigan. p. 77. ISBN 0-933691-09-2. ^ Garder, Helen; et al. (March 17, 2004). Gardner's Art Through the Ages With Infotrac. Thomas Wadsworth. p. 219. ISBN 0-15-505090-7. ^ Garder, Helen; et al. (March 17, 2004). Gardner's Art Through the Ages With Infotrac. Thomas Wadsworth. p. 619. ISBN 0-15-505090-7. ^ Patetta, Federico (1943). La figura del Bramante nel "Simia" d'Andrea Guarna (in Italian). 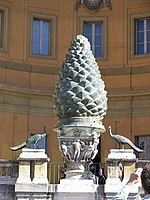 Roma: Accademia Nazionale dei Lincei. ^ His name is also often found as Jacopo Caetani degli Stefaneschi. ^ Gardner, 57-8, gives the documentation from the obituary book of St. Peter's. Most scholars date the altarpiece to c. 1320; Gardner dates it to c. 1300; Anne Mueller von den Haegen dates it to c. 1313; Kessler dates it to between 1313 and 1320. ^ Kempers and De Blaauw, 88-89; Kessler, 91-92. Wikimedia Commons has media related to Old Saint Peter's Basilica.